On the hopeful Saturday when my mother was about to have her respirator tube removed, my sister called her husband to see how the project at my mother’s house was going. My brother-in-law, Paul, and my husband were going to venture up into my mother’s attic to see about removing some mothballs. It all started when Mom was driven to distraction by the squirrels that were invading her attic, running around in the day and night no matter how many exterminators and roofers my mother employed. 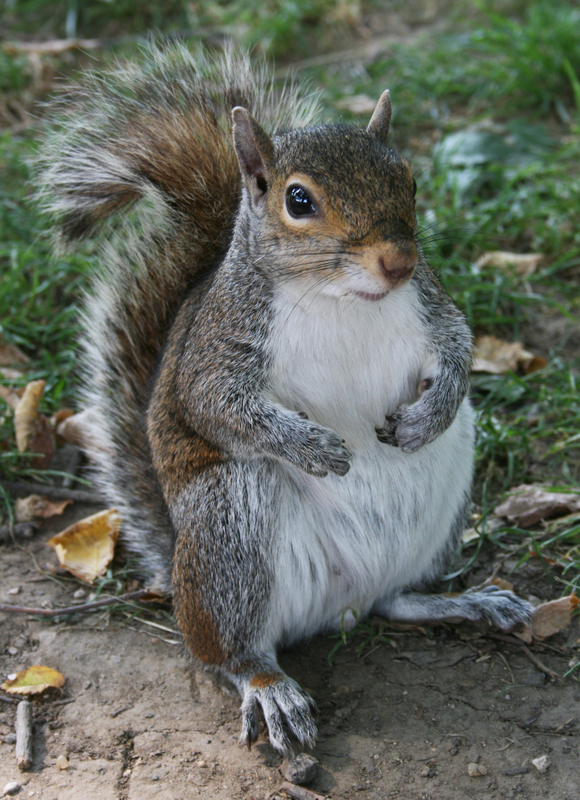 She thought she’d tried everything when someone told her that squirrels hated the smell of mothballs, and that if she put some mothballs in her attic, they would leave. Not one to use half-measures, Mom loaded up on mothballs and asked Paul to throw them all around her attic. Since Mom had gotten so sick, Paul had done some research on mothballs, and we all agreed that they were far too poisonous to leave in the house. The house reeked, and when David and I made a trip back home, we realized that all of our clothes smelled like mothballs after being in Mom’s house. The whole time I was thinking that this was the walk-in part of her attic with the little door in the bonus room. But no, this was the overhead part with the trap door that has to be lifted, tilted, and removed. When Karen called Paul from the hospital room to see how it was going, he said, “Now don’t get Cheryl upset, but the trap door fell on David, and I’m taking him to urgent care.” If I’d been paying attention to Karen instead of my mother and the stream of doctors and nurses coming through the room, I would have thought more about how she was suddenly saying, “Uh-huh” and “Mm-hmm” in that super-professional, fake sort of way that women don’t normally use with their husbands. After she hung up, she pulled me out into the hallway and said that the heavy board had fallen on David’s legs and ankles, and he may need a few stitches. At least it hadn’t fallen on his head. Although I would normally have driven straight to urgent care, my mother and her staff of twenty health care professionals kept us answering questions and calming Mom down, since she was terrified of the procedure. I got home a few hours later to comfort my poor, wounded hubby, but he waved off the whole incident as no big deal. He’d gotten a couple of stitches, he said, and then he proceeded to vacuum the entire house and pack all of our suitcases and gear in the car. When I went upstairs to get ready to leave, there was blood everywhere. All over the white carpet in the bonus room, all over the floor and shower in the bathroom, all over several facecloths and wads of paper towels in the trash. We spent some time working with carpet cleaner and bathroom cleaner and did the best we could. I thought of the knight in Monty Python and the Holy Grail who kept having limbs cut off, blood gushing out, while he’s saying, “Oh, that? 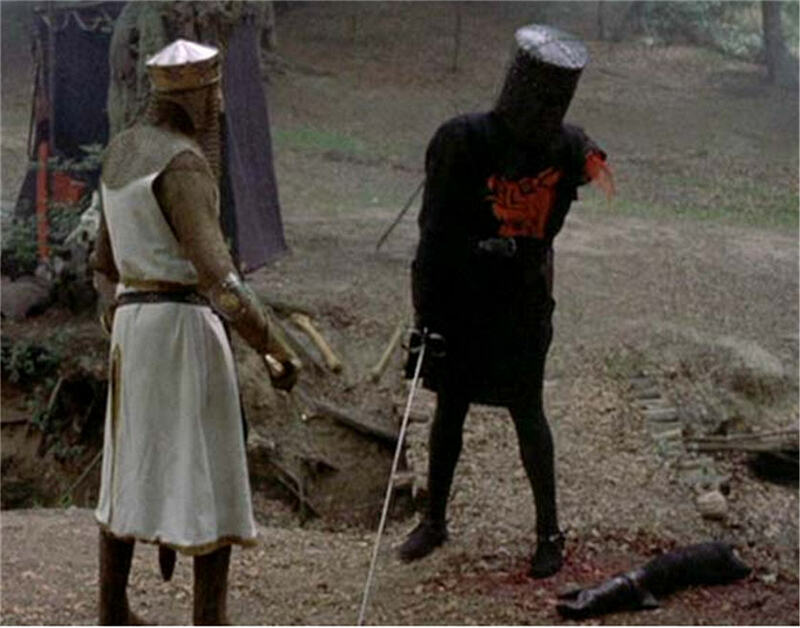 It’s just a flesh wound!” He was still ready to fight. Once again, it’s early in the morning, but I’m back in North Carolina—although not for long. My mother’s breathing tube was removed yesterday morning, an event for which we had all been longing. Mom did not like being on the respirator, and when the pulmonologist said Friday morning that although her pneumonia was much improved, he’d like to wait another day for her to strengthen, it was an agonizing 24 hours. When the tube came out this morning and we were able to hear Mom’s voice again, it was as if we had been imprisoned in a dark, airless place and someone had just opened the door to wide open spaces and beautiful sunshine. We knew that Mom had a long road to recovery ahead of her. After a few hours, David, Michael, and I said good-bye and went back to my mom’s house. We packed and cleaned and headed back to North Carolina late in the day, looking forward to going to our church Sunday morning and then to work on Monday. We had not traveled far when I received a call from my sister, saying that things were not going well. Mom had pain in her abdomen again, and a chest x-ray revealed that the pneumonia was rapidly increasing. My mother made it clear to everyone, both family and medical staff, that she did not want to go back on the respirator for any reason. We drove for another half hour and pulled over. We couldn’t decide whether to go on or turn around and go back. A phone call to my brother-in-law let us know that nothing would happen soon, so we continued and arrived home around 10 PM. We hoped to get to church, do laundry, and mow the now knee-high grass before having to make any more decisions. I finally got to bed around midnight, only to jump up at 2 AM when the phone rang. My sister had been called to come to the hospital, as my mother was having trouble breathing. Last week when this happened, she told all of the doctors to stop treatment, which threw us into a panic before she agreed to intubation. I didn’t know what to do tonight, since I had only had two hours’ sleep, and David and Michael had still not gone to bed. There was no way we could drive there safely. Naturally, I couldn’t sleep at all after that, but I sent Michael and David to bed so that someone could drive soon. After an hour, my brother-in-law, Paul, called and said that they had put a breathing mask on her and were still hoping that the new medication she would get later this morning would put her on the right track. Spending five days in ICU brings reality slamming right into your face. In our society, we rarely see people die. We hear about it, but it is nothing like it was for our ancestors who lived such short lives and had their loved ones die in their beds at home. At the hospital this week, there were two deaths while I was there. One of the patients had an enormous family—seven sons and all of their descendants—and they seemed to camp out in the waiting room. No matter what time any of us were there, they were there. Each day, they bought food in the late afternoon and invited everyone in the room to help themselves. On Thursday, the last son arrived from out-of-state, and they all filed in to say good-bye to their mother or grandmother. Then the life support was removed. Even though it was expected, it was so sorrowful, even to us. The next day, the woman in the next room was doing well in the morning and dead in the afternoon. This time, the sorrow was different: shocked, traumatic. We closed the sliding door and the curtains on the door. We gave them privacy, but inwardly, we grieved with them. I can hear birds chirping outside. They don’t know that they should hold their breath and be quiet, waiting. Hoping for good news, dreading the worst. Another day. It’s 5:30 AM, and I’m sitting in ICU, holding my sleeping mother’s hand. She’s been in the hospital for two weeks, and will be here for at least two more. Two days ago, we thought we’d lost this battle, but today, we hope that she’ll be sitting up with help this afternoon. The sound of a respirator is very soothing when you’ve only had four hours sleep for each of the past few nights. It’s dim in here, as the nurses match the ward lights to the time of day so that patients don’t lose track of their circadian rhythms. My mom just opened her eyes a bit and squeezed my hand, rubbing the back with her thumb. She can’t talk, so this is her way to say “I love you.” Now she’s back to sleep. She is so helpless, and it’s tearing at my heart. We all love in different ways, and at times like this, men and women serve in such different ways. Women tend to give physical human touch. My niece walked into the room a few days ago and immediately started brushing her grandmother’s hair. My sister and I hold her hand for hours at a time so that every time she wakes up for even a few seconds, she will be aware of someone who loves her sending her warmth. We’re constantly smoothing her brow or her hair, and we minister to her chapped lips as if life depended on it. While she is on the respirator, she can’t say a word, so we stay close with our hands. My husband, in the meantime, is holding my world together. David is the one who cleaned and straightened my mother’s house before my brother and his girlfriend arrived. He knew that it was important to my mom, even though she wasn’t there to see it. He’s mowed the lawn and fixed everything he could find that he even suspected of being broken. When I couldn’t sleep and decided to get up at 3:30 AM to shower and head to the hospital, he got up with me and made me coffee, eggs, and toast. While I finished getting dressed, he went out to my car and cleaned the inside of the windshield so that I would be safe driving in the dark. Later that morning, he showed up at the hospital with a cup full of my Fage 2% plain yogurt and fruit-only jam. He has made his diabetic wife’s health his number one priority. I think he is an angel inside a 57-year-old man’s body. A good nurse is a gift from God. A bad nurse is your worst nightmare. We’ve had some wonderful nurses ministering to my mother. They talk sweetly to her, leaning close to her face and helping her to maintain her dignity as a much-loved mother and grandmother. They bathe her, turn her, and care about her pain. They are smart and skilled, caring almost as much for the family as for the patient. We’ve only had one or two traumatic experiences with medical personnel who treat patients as if they were merely organisms taking up space in a bed, and we’ve had to intervene in one case, making the nurse aware of our dissatisfaction with her service. My sister and I didn’t leave my mother alone with her for a minute during the three long days of her shift, although she improved greatly after we talked to her. Most nurses, though, truly deserve the label “care-giver,” and they work hard with great compassion. Sitting in this room in the dark, I am comforted to know that there are so many people out there praying for us. All of those little things that seem so tiny and frivolous when you’re the one on the other side become little boosts that get us through the days. My sister’s church has someone here every day—not for a long time, as that would wear us out, but just long enough to ask how we’re doing and to pray for Mom. There have been cards and flowers, emails and phone calls. Our church is praying in North Carolina and keeping in touch with David by phone and email. Family friends and work friends are also emailing or facebooking, and all of it reminds me that there are people out there who care about us, even when I just don’t have the energy or the heart to respond. I need to remember that in the future: those small gestures are not useless. They can be a true support to someone who is grateful for any little sweetness coming from outside of the exhausting, narrow life that they are struggling through at the moment. Soon the sun will rise and the ward lights will come up. Another day, and whatever our hands find to do, we will do it with all our might.